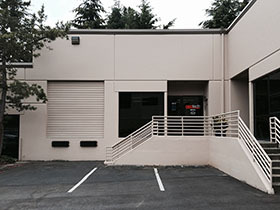 We are pleased to announce the opening of our third West Coast office in Kirkland, Washington. 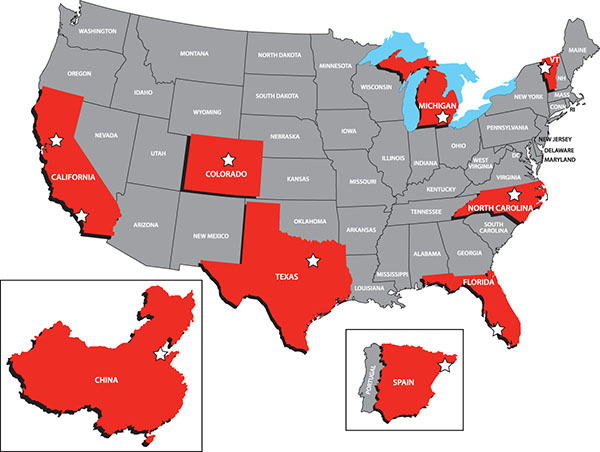 The location is made possible through the acquisition of INW’s Kirkland, Washington instrumentation rental, service and distribution center there. This is the ninth national service center for Geotech. The Washington office is conveniently located to provide rental equipment, service existing equipment and distribute Geotech equipment. 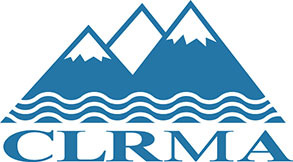 “We are pleased to add a location which will be convenient for many of our western region customers,” said Jeff Popiel, President and CEO of Geotech Environmental Equipment. “The INW Kirkland team is top notch. Their customer service skills and strong network are an excellent match for our enhanced equipment repair, maintenance and rental offerings. Every expansion of our services and facilities enables our company to grow; improving our ability to service our customers across the country,” said Popiel. 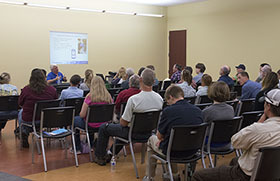 Jerome Gogue is the Regional Sales Manager for the center, and Geotech is in the process of hiring more team members to help grow the office. We are interested in knowing what items our customers would like us to stock. Please call us at 1-800-314-5325, at your convenience, to let us know how we may serve you. 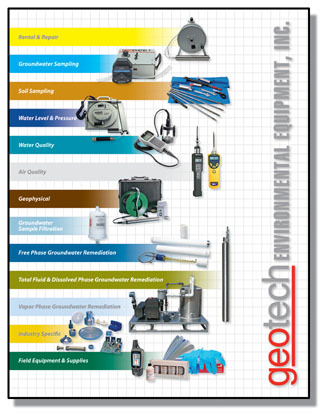 Geotech Environmental Equipment, Inc.'s acquisition of INW’s rental, service and distribution center in Kirkland, WA also came with two well known INW products that will enhance Geotech's groundwater sampling and monitoring product lines. INW is a leading manufacturer of pressure transducers and water quality instrumentation that are sold worldwide. “INW is excited to focus on manufacturing and supporting our distribution partners,” said Paul Eaton, INW Vice President of Sales and Marketing. 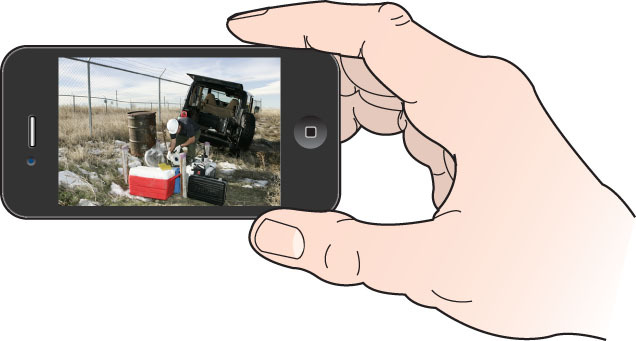 Geotech will be manufacturing, distributing and selling the former INW Dedicator® dedicated sampling system and the Reel E-Z® portable sampling system under the Geotech brand. Both systems utilize the highly respected Grundfos MP1 2-inch electric submersible pump (aka Redi-Flo2). Geotech is a Grundfos Master Distributor for Grundfos Environmental Pumps in North America. 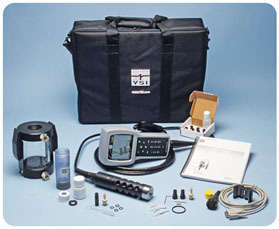 Dedicator® is a turn-key, dedicated sampling system designed for easy installation and operation. Each system is custom-built to well specifications, completely assembled, and tested prior to shipment. Dedicator systems include a low-profile well seal, exclusive Happy Hose!®, a Grundfos® 2-inch electric submersible pump, and all clamps and fittings. 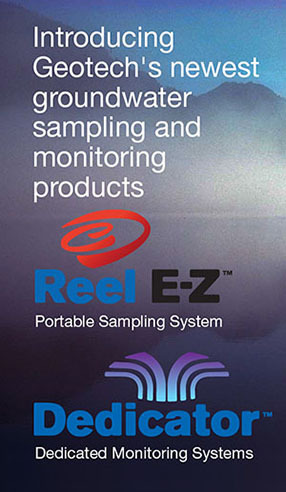 The Reel E-Z® is a portable reel system, ideal for one-person sampling and purging applications. The roller guide protects the cable from well damage, and its patented structure can accommodate both above- and below-grade well applications. A compact system designed to conveniently store and operate a Grundfos® 2-inch pump, the system easily installs the pump in the well, locks it in place and allows for easy take-up and cleaning without cable entanglement. 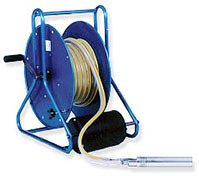 Geotech has many years of experience designing and manufacturing both dedicated and portable reel systems using the Grundfos pump. This complimentary blending will benefit both lines of products. 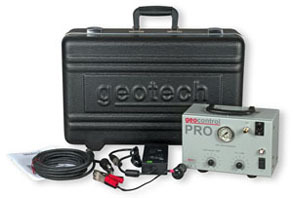 Contact Geotech to find out accurately which system will work best for you, dedicated or portable. 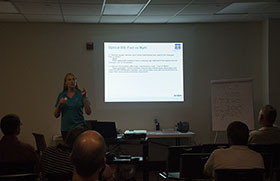 On June 19th and 20th, 2014, Geotech hosted our complimentary 6th Annual Field Days event, designed to provide our clients with demos, training and hands-on experience utilizing the latest tools, methods and technologies – without the travel and expense of trade shows and conferences. 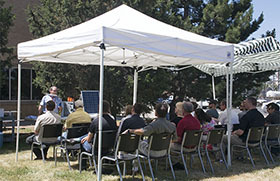 The event took place at Geotech's corporate headquarters, 2650 E. 40th Ave., Denver, CO 80205. Organizations presenting or exhibiting at the Geotech Field Days included: Geotech Computer Systems, INW, In-Situ, Ion Science, ProHydro, RAE Systems and Xylem. We at Geotech are very appreciative of our clientele and this event gives something of value back to the industry professionals who are making a difference in today's world. Plan to be there next year on June 25-26, 2015 for an even better event. Following Field Days, in conjunction with the Ronald McDonald House Charities, Geotech hosted the 14th Annual Charity Golf Tournament on June 21st. The tournament was played at the beautiful West Woods Golf Club in Arvada, Colorado. Approximately $20,000 was raised for the charity with the help of our sponsors and participants. 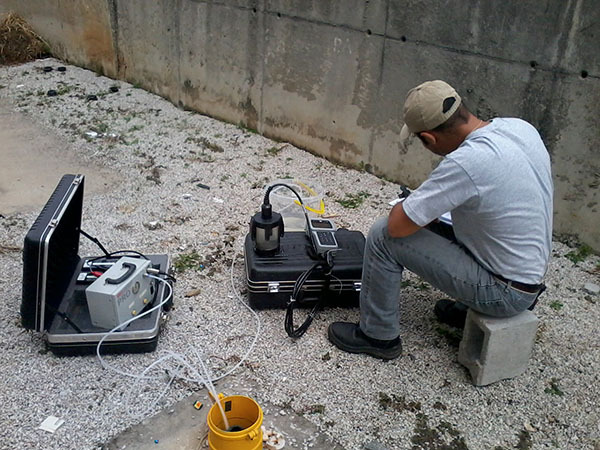 Vitorio Populin, a Director with Geoesfera Ambiental, took this picture of Jose Mattos sampling water from a well with a Geotech geocontrol PRO™ bladder pump controller and compressor. Join us for a day of activities on the water and demonstrations of the latest equipment from Fluid Imaging Technologies FlowCAM, Ted D. Miller Associates, Hach Hydromet and Geotech Environmental Equipment, Inc. with sediment sampling demonstrations by Steve Klein, macro-invertebrate collection and identification by GEI Consultants and a special tour of the Bear Creek Lake Dam. Prices and promotions mentioned in this newsletter are valid through July 31, 2014.